CEO Carsten Spohr is building the Lufthansa Group's strategy on three pillars. The first and largest consists of its hub airlines Lufthansa, SWISS and Austrian, where he is seeking to grow margins. The other two pillars are formed by its point to point airline and its aviation services businesses. For both, the focus is on profitable growth. Lufthansa says its short/medium haul point to point airline will be profitable in 2015. Nevertheless, it is progressively transferring the operation to its Eurowings subsidiary from Germanwings, which itself had been the beneficiary of point to point routes transferred from Lufthansa. Moreover, Eurowings is now also adding long haul routes, with capacity operated by SunExpress. Germanwings has never been truly low cost, whereas Eurowings' more flexible pilot contract offers the potential for unit cost more like that of other European LCCs, according to Lufthansa. Eurowings was previously almost invisible as a wet-lease supplier of Lufthansa regional capacity, but Lufthansa now aims for it to be the number one point to point airline in the group's home markets – Germany, Austria, Switzerland and Belgium – and the number three in Europe, behind Ryanair and easyJet. The aim for Eurowings to be the number three point to point airline in Europe can be interpreted in slightly different ways. Nevertheless, in order to assess where it lies currently, it seems reasonable to substitute "point to point" for "low cost carrier". On routes within Europe, the combined Germanwings/Eurowings is ranked number seven by seats among LCCs (source: OAG/CAPA, week of 23-Nov-2015). It is significantly larger than Air France-KLM's LCC Transavia (ranked 10th, combining both the Dutch and French operations), but is smaller than IAG's Vueling. The new Eurowings will need to grow larger than Norwegian, Pegasus, Vueling and Wizz Air in order to reach the number three position. This demonstrates not only the size of the challenge that it faces, but also the scale of Lufthansa's ambition for Eurowings. According to OAG schedules data as of the week of 23-Nov-2015, Eurowings currently operates a total of 61 routes, of which 14 are domestic and 47 are international. Four of the international routes are long haul. Every one of Eurowings' 57 short/medium haul routes (all within Europe) was previously operated by Germanwings and, in many cases, both Eurowings and Germanwings are operating alongside one another. Eurowings commenced operating its existing short/medium routes right at the end of the summer 2015 schedule, in Oct-2015. The four long haul routes were launched in Nov-2015, and eight more are currently planned by May-2016. These routes represent what Lufthansa sees as a high growth and profitable segment, namely long haul point to point leisure routes. Eurowings' commencement of these new routes marked the beginning of the transfer of Germanwings' operations to Eurowings, and the management of the combined activities of the two airlines as a single entity. Although the operation of low cost point to point routes is now being carried out by both operators, the two brands are in some senses interchangeable, and the Germanwings website is marketing both as an integrated offer. Germanwings is still operating 129 routes (source: OAG, week of 23-Nov-2015), of which 21 are domestic and 108 are international. It has no long haul routes, but operates four routes to destinations outside Europe: three to North Africa - Cologne/Bonn to Tunis, Marrakech and Nador, and one to the Middle East - Berlin Tegel to Tel Aviv). The relative numbers of routes under the EW code compared with Germanwings' 4U code gives a good indication of how much further the transfer of activities still has to go. The timeline set out by Lufthansa and communicated in its 3Q2015 results presentation suggests that the 'new' Eurowings will not be fully implemented until 2017. A first important step was the establishment of Eurowings Euro in Vienna earlier this year. Joint management of Eurowings and Germanwings has also been established under a new company entitled Eurowings Commercial & Service GmbH, in order to integrate all operational, commercial and support activities. From the beginning of 2016, responsibility for the Lufthansa Group’s point to point airline services will fall under a new Group Executive Board position, assumed by Karl Ulrich Garnad, who will also be responsible for Lufthansa's aviation services businesses. The new structure even allows for further new airlines to be added. Also in 2016, Germanwings' overheads will be transferred to the new Eurowings company. Eurowings' fleet will progressively be transformed to remove its CRJ900 regional jets, replacing them with A320 family aircraft and it will integrate Germanwings A320 family fleet. According to the CAPA Fleet Database, Eurowings' fleet currently consists of 22 aircraft (16 CRJ900s and six A320s). The CRJs will be replaced by A320s, both new orders and transfers from other Lufthansa operating companies. The Germanwings fleet currently comprises 62 A320 family aircraft (43 A319s and 19 A320s). By 2017, the new Eurowings narrowbody fleet will be standardised as A320 family equipment, with 89 aircraft. In addition, its widebody fleet (A330-200) will grow from two aircraft in 2015 to six in 2016, and seven in 2017. Eurowings' narrowbody fleet plans place it between IAG's Vueling and Air France-KLM's Transavia. Vueling currently has 100 A320 family aircraft and 60 on order (source: CAPA Fleet Database). Transavia aims to grow its fleet from 52 Boeing 737s today to 65 in 2017. The combined Eurowings/Germanwings operation will grow its available seat kilometres (ASKs) by 43.1% in 2016. This rapid increase will largely be the result of growth on long haul and the increase in the number of flights will be at the lower rate of 10.5%. Nevertheless, this is much faster than the hub airlines' planned growth in flights of 1.8% in 2016 (ASK growth of 3.4%). The point to point airline plans a further 30% increase in ASKs in 2017. All of Eurowings top 10 international routes by seats are within Europe (see table below). Four of them are between points in Germany and the UK. Although two of them are to London Heathrow, they mostly avoid major European hubs, in keeping with the point to point focus of the Eurowings/Germanwings business model. Eurowings is the leader by number of seats on six of the 10 routes, and the sole operator on two of these. Germanwings and Eurowings both operate together on three of the 10 routes. Duesseldorf Airport, which is by some distance Eurowings' largest current base by seats, is involved in all but one of these routes (the exception being Hamburg-Heathrow). On a city pair basis, Eurowings faces competition from Ryanair and/or easyJet (i.e. potentially both) on four of its top 10 international routes. Its low cost credentials will be tested by this type of competition, even if its product offering is seen as superior, especially as the gap in service quality narrows. Eurowings' top 10 domestic routes are smaller than its top 10 international routes by seat numbers. The list includes four routes. Eurowings is the sole operator on only one of the routes, but is in a duopoly with Germanwings (effectively they form a monopoly) on four others. Not surprisingly, its most common competitor on its top 10 domestic routes is airberlin, which operates on five. In addition to the short/medium haul routes from Germany assumed by Eurowings from Germanwings or, in some cases, operated alongside Germanwings, Eurowings has also established new routes (see table below). The principal Eurowings base outside Germany is now Vienna, from where it has launched three new routes this winter, and plans a further two in the summer 2016 schedule. Eurowings is also starting new routes from Germany, including Duesseldorf-Edinburgh and Hamburg-Ibiza. There is competition on all of Eurowings' new short/medium haul routes from Vienna. On the Vienna-London city pair it is competing with British Airways, easyJet and fellow Lufthansa Group member Austrian Airlines. On Vienna-Barcelona, the winter schedule also includes Vueling, Air China and NIKI. Austrian Airlines will resume its seasonal service to Barcelona in summer 2016, when NIKI will more than double its winter capacity to resume its seasonal leadership on the route. Although Austrian continues to operate on Vienna to London and Barcelona, it has ceased its previous summer-only operation on the more leisure focused Vienna-Palma de Mallorca, where NIKI's much higher capacity year-round service gives it a clear lead over Eurowings. Looking ahead to planned short/medium haul route launches from Vienna for summer 2016, Eurowings will face four competitors (NIKI, Alitalia, Vueling and Austrian) on Vienna-Rome Fiumicino, although easyJet is to withdraw from the route in Jan-2016 and Alitalia has ceased operating the route in the winter. On Vienna-Hannover, Eurowings will directly take over the operation of the route from Germanwings, in competition with airberlin. Away from Vienna, Hamburg-Ibiza is a summer only route, operated by airberlin from late April and, in the past two summers, by easyJet in the peak season only (July and August). Current schedules data indicate that both Eurowings (twice weekly A320) and Germanwings (once weekly A319) will enter the route in summer 2016 in competition with airberlin. Eurowings' long haul routes, all out of Cologne/Bonn, are operated on its behalf by SunExpress Germany, which is a subsidiary of the Turkish airline SunExpress, a 50/50 joint venture company between Lufthansa and Turkish Airlines. See related report: Lufthansa’s Eurowings goes to America; will the pilots unions allow US DoT to issue an exemption? 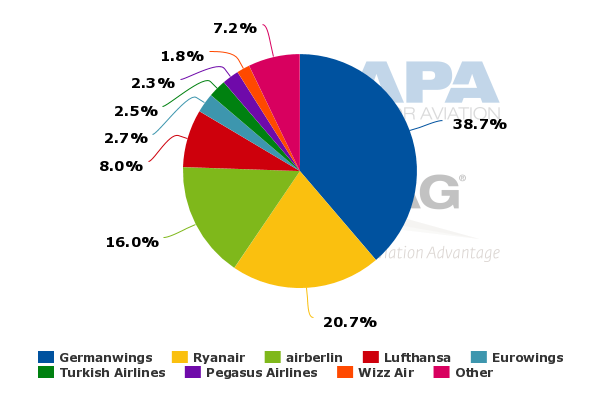 According to OAG data for the week of 23-Nov-2015, Germanwings is the leading airline at Cologne/Bonn, with 39% of seats (41% in combination with Eurowings, and 49% if Lufthansa is also added), ahead of Ryanair's 21% and airberlin's 16%. This should help to ensure good feed for Eurowings' new long haul network. Apart from those long haul routes offered by Eurowings, the only other from Cologne/Bonn is to Tehran. Eurowings has already commenced operations on four long haul routes from Cologne/Bonn: to Varadero, Puerto Plata, Punta Cana and Cancun. Planned long haul routes that have been announced for Dec-2015 are Dubai, Phuket and Bangkok Suvarnabhumi. Tehran, Las Vegas, Boston, Miami and Mauritius are planned for summer 2016. In winter 2015/2016, Punta Cana and Cancun are served on Eurowings' behalf by TUIfly. On all but one of the 12 long haul routes launched or planned by Eurowings so far, it is the sole operator on the airport pair. On Cologne/Bonn-Tehran, it will compete with Iran Air. Cologne/Bonn-Varadero was operated by Condor in winter 2014/2015, but Eurowings is now the only operator. Dubai, Bangkok, Miami and Boston are also served by Lufthansa from Frankfurt, and (in the cases of Dubai and Boston) from Munich. This may lead to some cannibalisation of Lufthansa sales to these destinations, but the impact is unlikely to be very high. Served by Lufthansa from main hubs? Lufthansa is to be applauded for taking the business of low cost point to point seriously. Germanwings was a start, but it had two major limitations in that it was not sufficiently low cost and its base of operations was confined to Germany. A lack of separate disclosure prevents up-to-date analysis of Germanwings unit cost, but CAPA has previously estimated that its CASK was not consistent with other European LCCs before Lufthansa started to transfer short/medium haul non-hub routes to it in 2013. It has taken a long time for Lufthansa to attempt to unlock the potential offered by Eurowings' more flexible labour contracts. Even now, it still faces opposition to the growth of Eurowings from its mainline pilot unions, but its intent is clear. A significant challenge will be to ensure that Eurowings' unit cost is truly low. A more productive and flexible labour force is a very good starting point, but sustainably low costs will require a more separate and distinct culture and management style than are present in the group as a whole. Lufthansa claims that Eurowings will have costs that are comparable to its competitors "on the same routes with the same aircraft types". However, unless and until Lufthansa provides separate traffic and financial data, it will not be possible to analyse Eurowings' unit cost in comparison with that of other LCCs. Rolling out the low cost brand into the group's other home markets outside Germany also offers opportunity. It is no coincidence that the most successful LCCs in Europe tend to be those with a broad base of operations across a number of countries. The size that comes from having a pan-European network allows purchasing efficiencies with suppliers and buying power with airports. In addition, a multi-base, multi-country strategy leads to brands that enjoy recognition by passengers at both ends of the routes, and allows access to local pools of labour on a more cost efficient basis. Nevertheless, Eurowings will still be relatively limited in its geographic scope by comparison with the likes of Ryanair and easyJet in particular. Moreover, after two years of rapid growth under the Germanwings brand, which is still far from the strongest LCC name in Europe, it is effectively starting again with the even less known Eurowings name. Lufthansa's assertion that its point to point airline will be profitable in 2015 puts it ahead of rival European legacy group Air France-KLM, whose LCC subsidiary Transavia is not expected to break even until 2017. However, Germanwings/Eurowings is a long way behind IAG's Vueling, which is set to make its seventh successive operating profit in 2015. As noted earlier, Lufthansa's LCC also lies between those owned by its two main legacy rivals in terms of fleet and seats. It will not be easy to leapfrog over Vueling and a number of independent LCCs to reach the number three position among European low cost airlines. With Eurowings' new long haul low cost routes, the Lufthansa group is really still only dipping its toe into long haul. Eurowings' current two widebodies (A330-200) in 2015, and plans for seven in 2017, compare with 156 wide bodies in the Lufthansa Group at the end of 3Q2015. Nevertheless, the new operation increases its options on long haul, as does its planned new JV with Singapore Airlines, and this will be important in an increasingly competitive long haul environment. Eurowings also gives Lufthansa options in its negotiations with its hub airline labour unions across its network, a key factor in improving profitability in the Group's historic core business. If it can successfully demonstrate that profitable growth can be achieved through new operating platforms, this will strengthen its hand in labour negotiations. Lufthansa faces challenges in achieving this, though if all goes well, it could not only provide it with a new point to point airline pillar of profitable growth, but also help to improve margins in its hub airline pillar.